Natural Non Pareil Supreme Almonds from the sunny inland valleys of Northern California. This delicious California nut is considered to be good luck in many parts of the world! 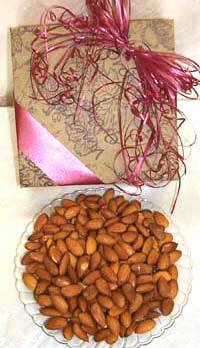 Natural Nonpareil Supreme Almonds from the sunny inland valleys of Northern California. This delicious California nut is considered to be good luck in many parts of the world! Research conducted at the University of California at Davis showed that a high-fat diet rich in whole almonds reduced the colon cancer risk in rats chemically treated to reduce this cancer. Other research indicated that phytochemicals in almonds inhibit tumor cell growth in culture. Specifically, the board notes, two flavonoid phytochemicals, known as quercetin and kaempferol, may be strong suppressors of lung and prostate tumor cell growth. ALMOND FACTS: Centuries ago, almonds are said to have originated in ancient China or the Middle East. Plantings of this crop moved westward to the Mediterranean region, where Spain and Italy became major almond producers. In the middle 1700s, the Franciscan Padres brought almonds to California to grace their missions. By the 1870s, research and crossbreeding had developed several of today's prominent almond varieties. By the turn of the century, the almond industry was firmly established in California where ideal conditions for growing almonds were found in the Sacramento and San Joaquin areas of the state's great Central Valley. Today, California is the only place in North America where almonds are grown commercially, where some 400,000 acres are under cultivation by over 7,000 growers. California grows over half the world's supply, including that for all of the domestic market.